These figures from 2006, published by the European Vaccine Manufacturers (EVM) expert group within the European pharmaceutical association EFPIA, underscore the fact that there is no other sector of the pharmaceutical industry in which Europe's pioneering role is as distinct. This is also solidified by the pharmaceutical companies' current location-oriented decisions: While they are currently also building production facilities for vaccines in the United States, Canada and China, and one company wants to establish a new laboratory for virus vaccines in the USA, the cities of Marburg, Dresden, Wavre (Belgium), Val de Reuil (France) and Rosia (Northern Italy) were selected for new production plants otherwise (compare map below). Furthermore, a new research center for vaccines for diseases occurring predominantly in developing countries is being constructed in Siena. On a global scale, pharmaceutical companies produce about 4.7 billion vaccine portions per year (EVM). 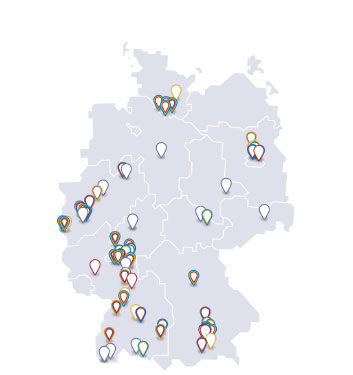 In Germany, they manufacture vaccines against influenza and avian flu, early summer meningoencephalitis (ESME), diphtheria, whooping cough and rabies as well as adjuvants for vaccine production worldwide. The production capacities are continuously expanded by the companies: GlaxoSmithKline has doubled its capacity for influenza vaccine production in Dresden for EUR 100 million, while Novartis Behring has completed a EUR 60 million innovative plant for producing influenza vaccines in Marburg in 2007 and will begin establishing a new EUR 140 million production plant for vaccines against ESME and rabies in 2008. One of the key factors in favor of these capital spending decisions has always been the great expertise and dependability of the local employees. Increased grant programs in the field of vaccines and the greater priority of prevention in health policy have had a positive impact in this respect. This includes the "Promotion of the development and use of vaccines" initiative by the German Ministry of Education and Research, which will run until 2010. Its goal is the promotion of academic research beyond the basic stage and up until the first evidence that an experimental vaccine is effective in humans. To ensure that Germany can increase its share in the global vaccine market with its annual growth rates of about 17%, additional measures will be required. Using an incentive system for all insured patients to counteract "vaccination laziness." With modern, growth-oriented vaccine manufacturers, Germany will be able to offer high-tech products in decades to come that are in demand worldwide and that are highly appreciated due to their benefits for both private and public health. As a result, any political commitment in this business area is a good investment.